Over the years, many intentional communities have drawn on works of fiction for inspiration. They can serve as cultural touchstones, helping connect the communities in a particular region with a shared philosophy or way of life. Here in the Pacific Northwest, books like Ecotopia and The Fifth Sacred Thing sit on many communal bookshelves. The Twin Oaks community in Virginia was modeled after Walden Too, while a planned community in South America is inspired by the feminist sci-fi novel Herland. But one of the most influential utopian novels of the past few decades is one you’ve likely never heard of. 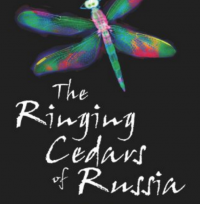 Called The Ringing Cedars of Russia, it has spurred a Back-to-the-Land movement in Russia and beyond. In the mid-1990s, there were few eco-villages in Russia. 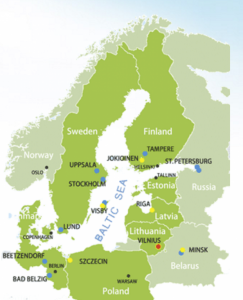 Now, there are hundreds of them throughout the Baltic region, including over 200 in Russia alone. Many have won the support of both the right-wing government and environmental organizations like Greenpeace Russia. What changed? In 1996, an entrepreneur named Vladimir Megre self-published a book called Anastasia, about an encounter he had with a woman who lived in the wilderness in Siberia. Although the veracity of her identity is a topic of debate, she was allegedly born in 1969 and lives on the River Ob – although doesn’t currently receive guests. While visiting with Anastasia, Megre spent three days learning about her way of life, including her philosophy on the natural world and her spirituality. She introduced Megre to the “ringing cedars,” 500-year-old trees that she claimed have mystical, healing properties. Megre returned home determined to write her story, and he self-published the first Ringing Cedars book in 1996. It included Anastasia’s proscription on how future generations should live: on sustainable homesteads a hectare or more in size, complete with gardens, beehives, a sauna, a water source, and more, with the primary purpose of raising healthy children. These homes were referred to as a Family Homestead or Kin’s Dominion. The concept took off, with thousands of fans forming readers’ groups, determined to create eco-villages of their own. Prime Minister Dmitry Medvedez praised the idea, and the government has begun offering families free land, a hectare in size, for those willing to move to sparsely developed regions of Eastern Russia. Not all of Russia’s eco-villages are connected to the Ringing Cedars movement; some, like the Land of Plenty commune, are home to over 50 middle-class families. Many of them were working professionals who wanted to leave behind the corruption and consumerism they experienced in big cities. Other groups are carrying the Ringing Cedars movement overseas, with projects like Anastasia USA hoping to connect American fans of the series to create their own homesteads. The site even has a “Find My Soulmate” page! At the same time, the books have received their share of criticism. Some see Vladimir Megre as an opportunist, cashing in on the “based on a true” story trope to sell his novels. Others point out that the books promote conservative family values – with a mother and father leading each homestead – rather than true egalitarianism and gender equity. Have you read the Ringing Cedar books? What do you think of them? Have you visited any communities inspired by them? Post your ideas in the comments below!